This article is about a Midnight Ocean flag. For the Sage Ocean flag, see Don't Panic (Sage). The flag Don't Panic was founded in January of 2004 on the Cerulean Ocean originally of the Midnight Ocean. by the pirate Xander. This flag is currently dormant. Don't Panic grew slowly, as most of the smaller flags did in the early days of Midnight. But after about a year, it was poised to be the last flag to take an island under the older 12-round blockade system. The third blockade of Papaya Island was hotly contested, but the eager mates of Don't Panic were well-organized and managed to take the island while sinking several boat-loads of mates from opposing flags. Papaya has since been unsuccessfully attacked several times by other flags. 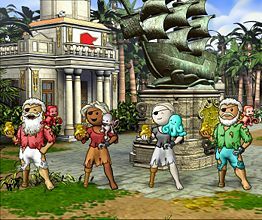 Late in 2006, Don't Panic successfully took control of Delta Island from the flag Raptus Regaliter, thereby becoming the owner of two islands. In Febuary of 2007 DP blockaded Park Island and claimed another island for their growing land holdings. In June 2008, the flag welcomed the members of Cold Fire following an agreement to merge the two flags. Among other achievements they became the #1 flag on the ocean at several periods. Don't Panic is not taking any formal alliances at this time. Should that change in the future, we'll gladly be tracking you down. This page was last modified on 6 October 2016, at 16:57.